How to Download and Watch 2018 FIFA World Cup Video on iPad? WinX HD Video Converter Deluxe is your best tool to download and convert 2018 FIFA World Cup video at one go for watching on iPad/Air/mini/Pro. It has been a long waiting for football lovers since last FIFA World Cup in Brazil in 2014. Gladly, the 2018 FIFA World Cup is just around the corner, and we can nearly smell it. The 21st World Cup is scheduled to take place in Russia from June 14 to July 15, 2018, which is the first time for Russia to host this international men's football tournament. 32 teams are chosen to the final tournament, who will surely bring us lots of vein-pumping matches in the upcoming summer. However, due to time zone differences, daily work, and also your energy, I bet that you're not able to watch every single match in front of TV. A good workaround is to download and convert 2018 FIFA World Cup online streaming videos to iPad, for watching 2018 FIFA World Cup offline whenever wherever. Usually, you need to download 2018 FIFA World Cup videos to computer firstly, then get a video converter to convert the videos to iPad separately. But with a professional all-in-one FIFA World Cup video downloader and converter, it can be solved with only ONE click. Besides, thanks to the unique support of Multi-track videos, this 2018 FIFA World Cup to iPad video converter enables football lovers to choose desired audio language track and subtitle track before converting World Cup games to iPad. WinX HD Video Converter Deluxe - the most ideal 2018 FIFA World Cup video converter for iPad, will bring football lovers sharp video quality and super fast video downloading and converting speed. It fully supports converting FIFA World Cup videos to iPad Air, iPad mini, iPad Pro, etc. Now, just follow the tutorials below to get started to download and convert 2018 FIFA World Cup games to iPad for offline watching. Step 1: Download and install this 2018 FIFA World Cup video downloader and converter to your PC. Step 2: Click "You Tube URL" button to import source video. After clicking, you'll see a pop-up window. Copy the source 2018 FIFA World Cup video URL you found on the internet, paste it and click "Analyze". This Word Cup to iPad video converter will present you all the details of this source video. Now choose your desired output quality. Then, check "Auto convert" and click "OK" to exit this window. Step 3: Choose iPad as output profile. You can follow Output Profile Category - Device Profile - Apple Device - to iPad, then you decide which specific iPad profile to choose. Here we choose to convert World Cup video to iPad Pro. Step 4: Select a destination to store the converted 2018 World Cup football game videos by clicking "Browse". Step 5: Click "RUN" to start converting World Cup games to iPad. It only takes a very short time to finish the conversion, then you can feel free to watch World Cup games on iPad whenever and wherever. 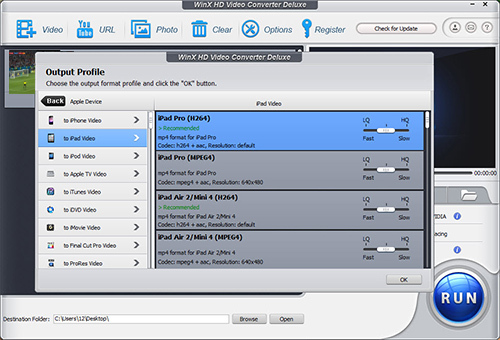 Besides converting 2018 FIFA World Cup online streaming videos to iPad, WinX HD Video Converter Deluxe is also able to convert World Cup football matches to iPhone, iPod touch, Android Samsung, HTC, Kindle Fire, MP4, AVI, WMV, H264, HEVC, MKV, etc.